How much does it matter where you're from in music? Because in some genres, nobody will care one way or another - as long as the music is good, most heavy metal or pop or indie acts couldn't care less which city or town from whence you came. But when it comes to music that not only just demands a degree of authenticity, but also harkens back to the community at large, location starts to matter. You see this a lot in country music, where regionalism across the United States and Canada plays a bit of a factor in defining the referenced landmarks and delivering a specific appeal. That's one reason why country acts love to reference rural tropes in their music: whether it's building a sense of community or just affirming the fact they came from that sort of upbringing, it's a nationalist spirit in microcosm. And yet in one of many bizarre similarities between country and hip-hop, rap music does a lot of the same. Thankfully we've moved past the eras of region conflicts between west and east coast, but there's still plenty of references and callbacks to the places where these artists came, to frame their stories, add richer detail and context, and give their music a definite sense of place. Both country and hip-hop have a sense of richer history about them, and defining one's place with respect to that history is a major part of some rappers' careers. So when I started to look at Ratking, an upstart alternative hip-hop duo from New York known for chaotic and noisy production in the vein of acts like Death Grips and Clipping and with a reportedly strong punk sensibility, I was curious in spite of my own issues with this particular brand of noise rap. After all, the Beastie Boys were New York rappers who had inclinations towards punk, and they were some of the most influential and awesome acts to ever rock the music world, so it made a certain amount of sense for me to at least get a familiarity with this sort of music. So I picked up So It Goes and gave it a few spins - how did it go? This is an interesting album, not in the least that it took me a lot of listens to really decode why I like Ratking's So It Goes, but don't quite love it. It's definitely something far removed from mainstream hip-hop, but at the same time it was a lot more accessible than an act like Death Grips and I was surprised how much I really appreciated the subtle touches by the end of this record, enough that I'm going to recommend it if you've got a taste for hip-hop production that is decidedly off-beat. So let's talk about that instrumentation and production, shall we? The funny thing you'll notice is that after the initial shock at the cluster of noisy effects all jostling for your attention is that there is melody underscoring these tracks. The production isn't so much expansive but a block of competing sounds, a cacophony of voices, samples, and clattering percussion, with the occasional distorted horns or classy jazz sample providing a driving melody. It's intentionally claustrophobic, meant to create images of an overcrowded city - and goddamn it, if Ratking doesn't nail this in their production. The juxtaposition of decaying old school class with new world samples and rhythms, all dragged through a clattering mire of crackling fuzz doesn't paint a pretty picture of the nastier parts of New York City, but it certainly feels accurate. And I'll admit right out of the gate this production can become a little too overstuffed for me at points, especially when the various vocal samples have similar volume levels to the actual rapping, and while it's clear that's intentional, in order to force you to listen for the voices among the masses, it can get distracting. And yeah, even though I loved the riotous energy on 'Remove Ya', the bleakness of 'So Sick Stories', the thrumming pumping beats on 'Puerto Rican Judo', and the classier elements of 'Eat' and 'Snow Beach', the chipmunk voice effect on 'So It Goes' was just intolerable. Now this takes us to the rappers Wiki and Hak, and let me stress this album, for the many moments of clever wordplay, isn't an incredibly technically-driven rap album. Once you manage to get your head into the same space as these guys, the songs and their flows are pretty straightforward - but honestly, that's not a problem. When you have beats this layered and are working to paint a picture this detailed, a straightforward approach to delivery works very well. Wiki comes across as more outwardly aggressive and revelatory in what he chooses to admit, while Hak's hunger is more understated but no less effective. But they both bring clarity in their purpose: to paint a very vivid picture of modern New York life for people in their demographic and situation. And there's a lot of facets to that picture in defining these guys as characters and the city in which they live, both in how it drove them to rap music and away from the streets and the problems of their lives. And it's when they address some of these problems in the context of New York as a whole that they have some of their strongest tracks, namely the anti-cocaine 'Snow Beach', the stop-and-frisk condemnation of 'Remove Ya', and 'Eat', where Wiki deals with an Oxycontin addiction that nearly destroyed his life. Yet both guys seem very much aware that their voices are just a few in the vast canyons of skyscrapers that is New York City, and on songs like 'So Sick Stories' and the title track, they touch on the universal feelings of loneliness, depression, and eventual resolve to at least be heard as a voice in the city. If we're looking for a theme of this album, I'd argue it comes through most here - that people of their, and my, generation aren't being heard, and even despite the cacophony, their stories are just as relevant. And here's where I run into my small gripe with this album, because this is a powerful theme and the texture in its realization is incredibly immersive in pulling you into their vivid stories. But for the stories that they tell, they feel a little disjointed and don't really add to a completely cohesive picture. Now, to be fair, that's life, it never fits a defined narrative and given the realism Ratking are looking to evoke, that makes sense. But at the same time, the album does start to drag at points when they revisit certain topics, and I start wishing this album had a little more narrative ambition besides painting that incredible picture. We get fragments of more stories, and I wish more of them materialized. 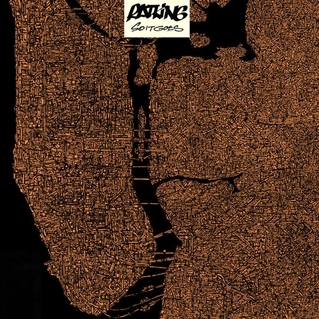 Yet even still, I respect So It Goes by Ratking a lot, and while it took me a while to get into it, there's a real potent statement beneath it and two clever and solid rappers delivering that statement. And while I admit the production will probably never completely be my thing, I can't argue it does a great job for what it is. As such... yeah, 8/10, and definitely a recommendation if you're looking for some hip-hop that's off the beaten path. Friendly warning, this material is not immediately accessible and it'll take multiple listens to truly appreciate this record, but these are voices you'll want to hear.